Chicago – Riot Act, Inc.
Riot Act Inc.’s second production of our 16th season lands with a bang with our first musical in six years. 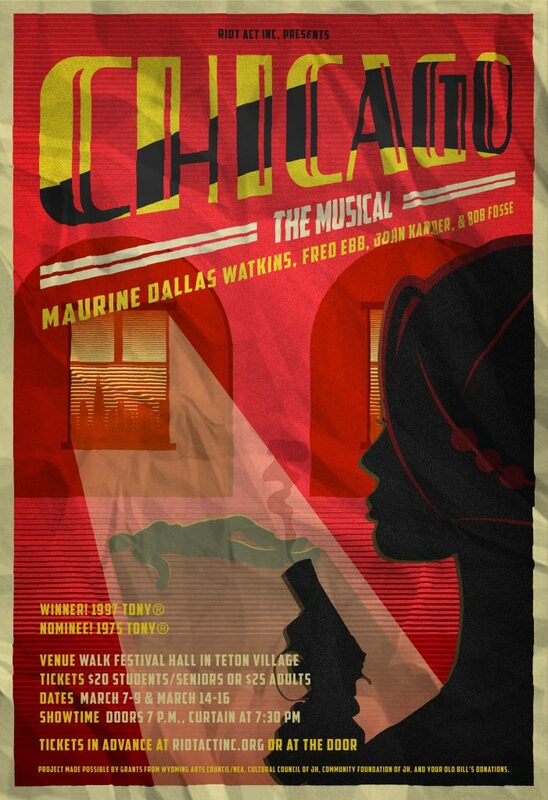 Chicago by Maurine Dallas Watkins, Fred Ebb, John Kander, and Bob Fosse, running March 7-9 & 14-16 at the Walk Festival Hall in Teton Village. Helmed by director Macey Mott, stage manager Jessica Schiers, choreographers Allison Lenz and Margaret Breffeilh, musical director Laura Huckin, and fight director Matt Franta. The show boasts a wonderful cast including Angel May Wise, Anna Senecal, Chad Horton, Charley Daveler, Cory Kulacz, Henry Raynor Williams, Inger Hanson, John Tanis, Karissa Dabel, Kelsey Johnson, Kristin Livingstone, Kristina Peterson, Lynnette Parry, Mila Berry, Patrick Nolan, Patty Krause, Sharifa Suniga, and Tenessa Singleton. Tickets are available in advance online at www.riotactinc.orgor at the door and cost $25 for adults or $20 for students/seniors. Riot Act, Inc. T-shirts, Riot Act, Inc. Stickers and Concessions will be available at the concession stand before each performance and during intermission. The Jackson Hole Book Trader will be selling books related to the topics of Chicago and from our Beyond the Curtain event.